I loves me a snazzy hotel. Fluffy bathrobes, fancy bath products, decadent room service…. I tell ya, some hotels are so luxurious, I never want to leave my room! BUT in addition to all the other crazy travel snafus that can trash your trip (like THESE 10 things)…even the ritziest accommodations are subject to safety and security risks. So what’s a gal on the gadabout to do in order to keep safe and sound on the road?? For theft, we obviously want to prevent it. As for the other two concerns (assuming you’re not a pyromaniac), it’s more a matter of how to quickly and effectively get your bod out of your room and off to safety! Give this a read-through, and maybe even print it out to take on your next trip. At worst, you never actually need any of these tips; but at best, these could end up SAVING YOUR LIFE! They’re so happy because he didn’t say her room number out loud! Request a room on floors 3-6. These floors are high enough to make it tough for criminals to climb in your window, but low enough that they’re still reachable by fire truck ladders. Request a room away from the exit stairwell. Thieves like to target rooms in these areas because they provide a quick escape route. One more VERY important point: don’t forget to let your credit card company know you’ll be on travel BEFORE you take your trip. 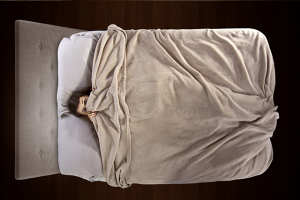 Among the many other potential trip disasters (you can read about 10 of them–and how to prevent them–right here), having a hotel decline your credit card is annoying at best–and a potential nightmare if you can’t get it straightened out before bedtime. Find your two best evacuation routes. You can do this by looking at the plastic placard bolted to the back of your door. If you’re at a hotel in a foreign land that lacks this info, make a note to pace out a few routes when you first leave your room. Check that the door to any connecting hotel room is locked. If your windows or patio door can be opened, make sure they are locked. And be sure you relock them every time you leave your room. 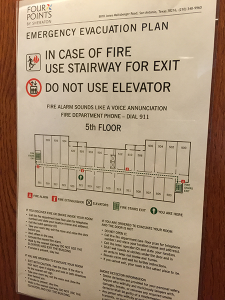 Find the hotel’s emergency number. If it’s not posted by the phone, call the front desk to get this information. If they don’t have a designated number, make sure you find out the city’s or county’s reporting number. 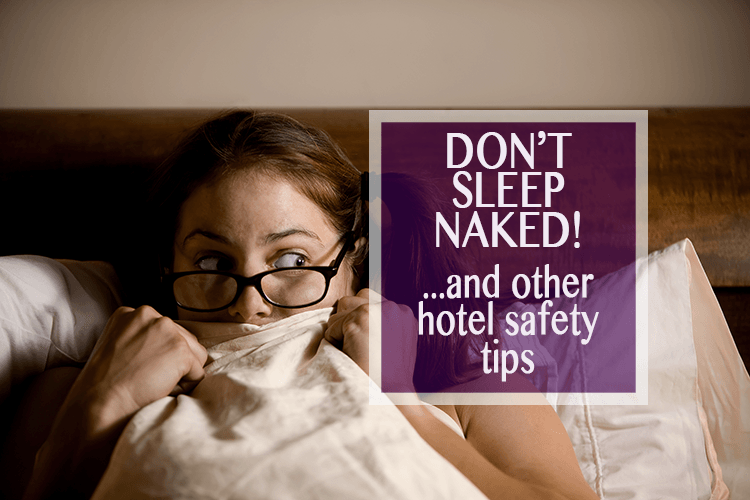 Don’t sleep naked! If you have to evacuate in a hurry, the last thing you want to be doing is fumbling around in your suitcase for clothes. As entertaining as it might be for fellow guests to see you in your birthday suit at the emergency assembly point, you’ll want to wear clothing as a layer of protection against whatever hazards may lie upon your evacuation route. Keep shoes next to the bed while you sleep. If there is broken glass or other foot-unfriendly debris on your evacuation route, wearing shoes will keep you from becoming hobbled as you make your way to safety. Hide your valuables somewhere weird. 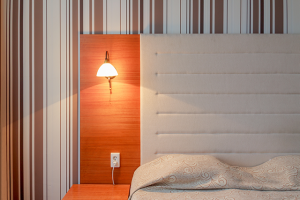 In-room safes are notoriously easy to open, plus they provide an obvious place for thieves to look for valuables. So put your jewelry, documents, etc., in an unlikely location. A box of tampons is a great place for this. And do I even have to say this? Lock your suitcase when you leave your room! This nightstand is far too barren to belong to a prepared person such as yourself! You’ll also want a smoke hood. Set up a mini grab-n-go kit. Put your wallet, keys, essential medications, etc., in a little pouch and keep them next to the bed so you can easily grab them if you need to evacuate. I use a kid’s fabric pencil case for this. Consider packing a travel door alarm. I personally don’t use one, but for women traveling alone—especially when staying in less-than-nice hotels, I can see the advantage of having a device that emits a piercing shriek if someone tries to sneak into your room while you’re asleep. ALSO: definitely consider Travel Insurance before you head out of the country–especially to an exotic destination. Not having travel insurance is one of those “gotchas” that can result in 10s of 1000s of dollars of expenses if you get injured during an emergency (or even just doing something mundane, like falling off a curb!). I’m not gonna lie: the first few times you run through the tasks I’ve recommended, it’s going to feel like a huge pain in the a$$. But after you get a couple of hotel stays under your belt while following this protocol, it’ll become second nature! Got any other hotel safety tips that I missed? Share them via the Contact form! I talk about all sorts of other risks in my free Travel Solutions Guide: “10 Travel Mistakes That Can Ruin Your Trip…and How to Avoid Them” ⬅ You owe it to yourself to read through it before your next vacation! Totally agree about the emergency light. People look at me weird sometimes because I have a flashlight attached to the outside of my pack (so I don’t have to fumble through pockets in the dark) but I can’t tell you how many times it has come in handy!